Who’s Funding the Competing Minimum Wage Initiative in San Diego? Where am I supposed to get this extra money to pay double wages? Either I raise my prices by half again ( and lost half my customers and risk the business) or cut loose half my workers and work the rest twice as hard. You all seem to think I as a business owner have massive cash in the bank, or a magic wand to wave and create money. I don’t. The economy is screwed and revenue has been dropping for the last 6-7 years. This proposal is only going to result in massive unemployment for the unskilled, or higher prices. Nobody is going to pay $13/hr (actually $18+ real costs if you add in taxes) for a worker who is bringing in only $15/hr. We get slaughtered by regulations out the ying yang, taxes 4 times a year, surprise inspections, constant threat of lawsuits etc and now this. This idea is ridiculous. The Government fixed inflation. There is no inflation any more, just ask them, they have proof. Bull pucky; many of the proposals are for companies with 500 employees or more. Small merchants are not the ones who will have to cope. The income gap has grown dangerously wide over the past decades. This is a democratic way to level the playing field just a wee bit. Then that would mean fast food joints will still be paying the $8 min wage since most are owned as independent franchises. If that’s the case then this whole movement is meaningless. Let make it $50 per hour. That will really level the playing field and with that extra money all of our economic problems will be over. Think of the possibilities. I’m sorry, you really don’t understand the concept of trying to get people who work their asses off some kind of wage that they can actually live on. Instead why not abolish the minimum wage altogether? Instead have a maximum CEO to worker pay ratio – say 50:1 so if a CEO wants to make more than $1,000,000 a year they have to pay their lowest wage employees more than $20,000 a year. Why not build more and taller properties in OB? Wouldn’t that provide jobs in the town and increase the supply of homes, making them more affordable for people who are making the minimum wage? People often complain about the cost of living at the beach, but that seems like a sensible means of providing more and cheaper homes for the 99%. I agree with silverstein. The idea is ludicrous. While the desire to raise wages is commendable, people don’t realize the damage it would do to business owners. Sure, raise the wages and then put people OUT of business, which is just adding more liability for the State when they file for unemployment. With the costs of workers compensation (which is a flawed, brutally idiotic system that always sides with employees regardless of the facts) and liability insurance, I’m not really sure how Democrats think a wage increase of this magnitude would benefit society. How are small businesses supposed to cope with paying higher wages? They will learn to do more with less, they will raise their prices, Or they will pay under the table and subvert the whole taxation process. And most importantly, they will replace you with a machine…it will finally make economic sense. You are simply stirring the pot. Way to go liberals, thinking of yourself and nothing else as usual. Putting up the minimum wage is the wrong way to go… it will increase the cost of everything and that includes everything the mimimum wage earner needs to buy… they will spend every penny of the wage increase and will gain nothing. Fact remains minimum wage jobs are just that… they are “kid” jobs … Jobs I did in high school and college for extra cash… They are not and were never to be “head of household jobs.” Before you start a family a reasonable person would work their way up to a better paying job THEN marry and have kids…. This is backwards now.. Sad !!! Really you are arguing for a minimum wage increase. Saying that it is backwards now implies it wasn’t before. Presumably you are talking about the 50s and 60s when the minimum wage was much higher relative to buying power than it is now. The minimum wage jobs pay for less today and the middle class (head of household) jobs you talk about have rapidly been disappearing. By your logic people should deal cocaine instead of work at McD’s. 3If you have kids to support and you have a choice between working at McD’s for minimum wage or dealing cocaine to rich people for 50 times the money, which would you choose? If it wasn’t for poor farmers having a dozen kids 200+ years ago many of us would not be here today. are you nuts ?? who said anything about dealing cocaine…. I am saying that i worked many minimum wage jobs while in college and high school then I moved on to get a better job and THEN had kids —- The backward thing is these kids have kids and expect to raise them flipping hamburgers… Sorry but that doesn’t work and as I said raising the min.wage will only put prices higher for everyone – including the ones who make the min.wage. By the way I worked for $1.09 / hr. as a waitress plus my tips.. we lived on our tips back then. Yeah I am dating myself but our elected officials these days seem to be only driving this country in the ground. Sending jobs overseas with regulations, etc. More regulations than any small business can handle… Obamacare is the next thing that is going to close small business and put people who work for larger businesses out of work… Lots of good things they could have done for health care but did not. The workers can not continue to pay for those who do not work (and alot of them could) there are way too many of them and not enough of us working people….. And getting worse. Jobs go overseas because of greed more than regulations. What are the regulations that have outsourced US call centre jobs to India, and Indian call centre jobs to Vietnam? Sure garment workers jobs go to Bangladesh and manufacturing jobs to China because of lax regulation, but that also results in things like the Savar building collapse killing over a thousand people, and cancer villages in China. This isn’t the first time the minimum wage has been raised so how did small businesses cope all the other times it was raised? Most businesses already pay more than the federal minimum wage. The US has the lowest minimum wage relative to average income of any developed country. Countries with a higher minimum wage like Canada do have higher prices and a thriving underground economy. But that isn’t the only part of the equation. When the minimum wage gets raised you also get better employees. If it were say $15/hour you would get better trained, more capable employees that can do more work. It would make it much harder for teenagers and college students to get a job though. Where is the blame for corporations like WalMart who pay so little that their workers qualify for State subsidy programs? Liberals wouldn’t be able to make their points so well if Conservative companies like this weren’t bleeding the system. People getting replaced with machines has been going on long before there even was a minimum wage. This is never going to happen for waitresses and other workers who are the employees of the small businesses most impacted by a minimum wage increase. Seattle is considering raising their minimum wage to $15 – over I think 3 years. They call it “democracy” – yeah! 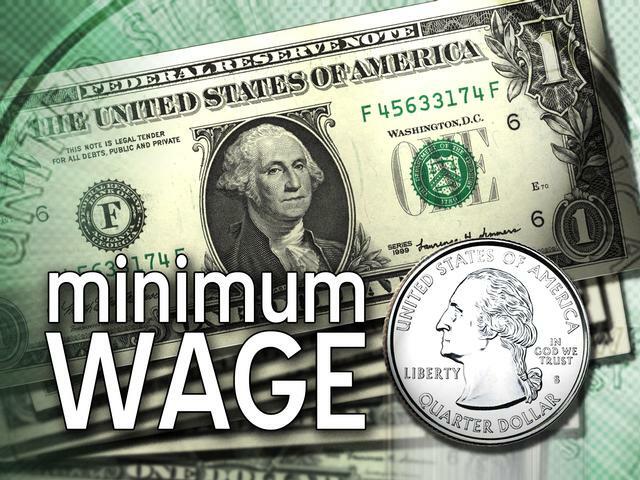 They are already the closest to $15 since Washington has the highest State minimum wage in the US at $9.32. They are also one of four States that has a separate ‘youth training’ minimum wage – $7.81. That balances paying adults a living wage with keeping youth unemployment down. As the highest paying US State they are still lower than every Canadian province. Even though the US has way more money per person than Canada. Of course this doesn’t even cover the incredibly low ‘tipped’ federal minimum wage in the US – currently $2.13. The lowest rate in Canada for workers who receive gratuities is $8.90 in Quebec. Some people talk about $15/hour like it is unheard of, but Australia already has a minimum wage above $16. France is not far behind. The numbers that really tell the story are CEO vs worker pay ratios. Where I live there is a progressive company Lee Valley Tools that insists on having a humane CEO to worker pay ratio – they set theirs at 10:1. This rate is more equal than any country’s average. In France it’s 15:1 Canada it’s 20:1 the US is 475:1 and at Walmart… wait for it… 1034:1 !! Instead of a minimum wage increase force a decrease in Federal Reserve money printing. The Federal Reserve has printed $12.6 trillion in the last ten years and 95% of that went to the billionaires. That needs to end. Productivity gains should make a fixed minimum wage worker better off. Instead that productivity went to Washington DC and Wall Street. I spend a lot of time in DC and the wealth that has poured into that area is astonishing. A living minimum wage/ retirement benefits – is in direct conflict with our Ruling Classes’ agenda to funnel ALL wealth into their already too FAT coffers, but too much is never enough for the uber-greedy. 1. They got their stooges in Washington to export USA families jobs en’ mass under the guise of “free trade” (one of many dupes on the gullible American public) – who prefers sound bites to substance. The legislation includes PNTR, NAFTA, etc. Bye, bye middle-class jobs – hello record profits for multi-national corporations, & their own. 2. Allowing 3rd world immigration en’ mass – in a country with so many already out of work – puts further downward pressure on wages for labor – no other civilized country so oppresses their own citizens with such a selfish & shortsighted scheme. 3. Our middle-class was the envy of the world – created by God, Henry Ford & Union workers (who used to understand the value in supporting their own). The NY Banksters/Robber Barron’s hated Henry Ford for PAYING over DOUBLE the going rate for labor at the time. Crazy? Like a fox …. Mr Ford understood that fairly compensated people could actually afford to buy things …. duh. So essentials only – how much does it cost to live here? Our nations obsession with, & pandering to the ultra-Greedy, ultra-Rich – is becoming our undoing. Wage parity nations have much happier & more contented populous, that ones with great disparity’s in wealth. Ultimately, that’s good for everyone. Older Article: How Should California Test for Marijuana DUIs?